This title was first published in 2001. The hierarchical approach of regional planning institutions is facing crisis. In an era of globalization, the conditions of urban growth dynamics is dependent on innovation, entrepreneurial and economic structures and socio-political and institutional forces. As a result, the notion of 'region' has become more about social interaction than geographical location. This volume examines how institutions must adapt and modify their roles to suit this changing pattern of development, by implementing more consensus-based approaches. Using in-depth analysis of an innovative state-sponsored approach to growth management planning in the USA, it assesses the effectiveness and success of putting into place more flexible, concerted and negotiated approaches to issues such as inter-institutional relations and inter-governmental co-ordination. In what will be an essential contribution to the debate surrounding the future of regional planning and the role of institutions, the volume highlights the limits and opportunities of these new policy approaches and will be a key resource for planners, policy makers and researchers alike. Contents: An 'Institutional Turn' in Planning Theory? : Governance and the challenges to institutional innovation; Redefining institutional issues: a planning-theoretical review; Perspectives on consensus-building in planning. An Experience in Institutional Innovation: The Cross-Acceptance Process in New Jersey: Introduction: a new planning style; Genealogy of the cross-acceptance process; Cross-acceptance: plans and procedures; Cross-acceptance: the coevolution of processes; Cross-acceptance: an interpretive summary; Conclusion: the fortune of cross-acceptance. 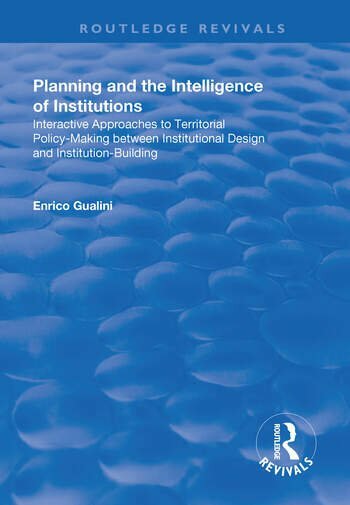 Rethinking the Dimension of Institutionalization in Planning Practice: Planning, social interaction and institutionalization; New-institutionalist perspectives; Three relevant dimensions of institutionalization processes; Institutionalization processes and collective action; Conclusion; Bibliography; Index. Enrico Gualini, University of Amsterdam, Holland. Graduated in Architecture at Politecnico di Milano in 1988 and gained his PhD degree in Planning at the Dipartimento di Scienze del Territorio, Politecnico di Milano, in 1997. He is now based at the Amsterdam Study Centre for the Metropolitan Environment, University of Amsterdam, Holland.